This miracle happened right here two weeks ago. Yes, this Planning-Mom-Extraordinaire did spontaneous. My son woke up from his afternoon nap and I loaded my kids into the minivan for a trip to the beach. The library’s summer reading program is hosting a ‘drum circle’ every Wednesday evening along the beachfront. They had drums of every size and variety, egg shakers and rain sticks, tambourines, maracas and more. My son claimed the upside down 5-gallon bucket that he could beat on with a drum stick. We played music. My kids climbed on the playground. We explored the library truck and found the exact book we’d been looking for since summer began. Then we headed on to our evening activities at church, driving through the KFC to grab a quick dinner first. I squint my eyes because they have all these meals with chicken and biscuits and sides and half gallons of lemonade and who knows what else and I can’t see the tiny little print underneath all of that. I want chicken. I just want a bunch of pieces of chicken to feed all the people in my family. Try ordering that through the little noise box, though. Finally, I collect myself enough to order food, but I realize as they hand it out the window that I forgot to order a large lemonade for my kids to share. Still, I had taken them to the beach. I had let them play on the playground. I had ordered them food from a drive-thru. Surely, I still had some claim to supermom status. I had Caprisuns and cold water. Would that do? A child (who shall remain nameless) could not get over the fact that I hadn’t ordered a drink. She glared. She huffed. She whined and complained and confronted me with my oversight. Nothing makes you feel like a Mom-failure so much as an ungrateful child. Really, it’s a struggle for me anyway. Maybe it’s that way for all moms. No matter how much we are doing, it just never feels like it’s enough. It seems like others are doing better. Other moms are more….more fun, more wise, more crafty, more creative, more gentle. I’ve been working really hard this summer to improve my spontaneity, flexibility, and effort at playdates. But every single time I do something spontaneous, flexible, fun and playdate-ish, they want to know when they can do it again. What about tomorrow? What about a sleepover? However much I’ve done, it’s just not enough. “Communication is her best asset, but she often feels like she’s not good enough at having fun or coming up with creative ways to laugh and be spontaneous with her children” (Brooke McGlothin). Ahaziah also followed the evil example of King Ahab’s family, for his mother encouraged him in doing wrong (2 Chronicles 22:3 NLT). I’m not the perfect mom. None of us are. But we also don’t have to be perfect. God doesn’t expect that of us or require it. I read about Ahaziah’s mom, how she actually encouraged him to do wrong, and I breathe deeply of grace. Because if there’s one thing I do, it’s love Jesus and His Word. Spontaneous might not be my thing, but encouraging my kids to do what is right—yeah, I’m totally into that. So, I’m working on teaching my kids gratitude and appreciating what they have instead of greedily demanding more, more, and more…. But I’m also teaching myself that I don’t have to be the mom their friends have or the mom on Pinterest or Facebook. I have to be the mom God has called me to be. When the woman broke that alabaster jar and poured the perfume down over Jesus’ head, those at the table criticized her offering. It wasn’t perfect, right, acceptable. 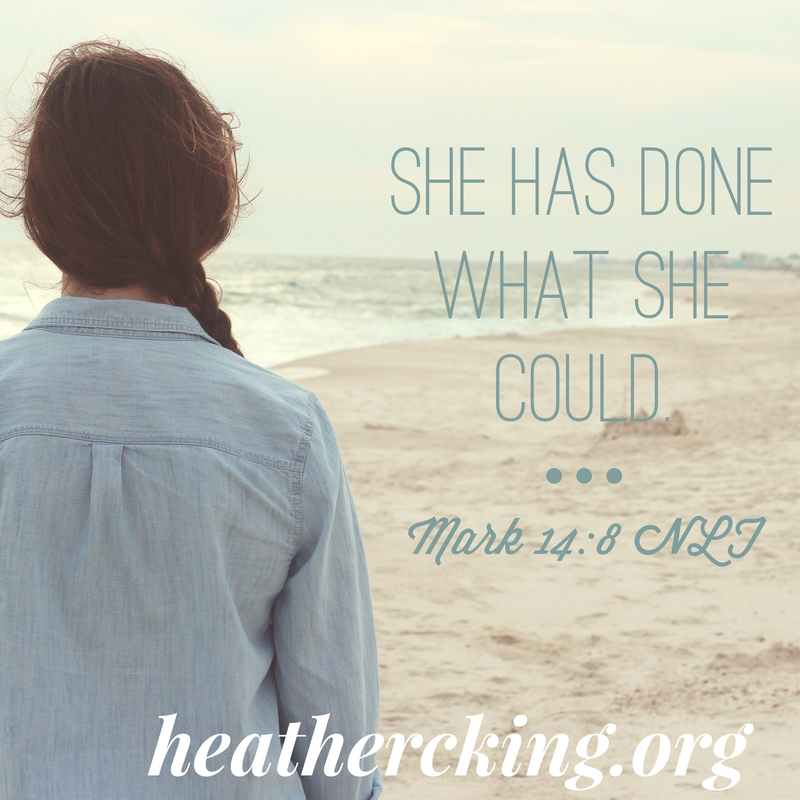 But Jesus said this, “She has done what she could” (Mark 14:8 NLT). Dear Mom, God isn’t expecting you to be perfect; He finds your heartfelt, all-in offering beautiful. He knows when you’ve done what you could and that is indeed enough. Heather King is a busy-but-blessed wife and mom, a Bible Study teacher, writer and worship leader. Most importantly, she is a Christ follower with a desire to help others apply the Bible to everyday life with all its mess, noise, and busyness. Her book, Ask Me Anything, Lord: Opening Our Hearts to God’s Questions, is available now! To read more devotionals by Heather King, click here. Awesome work you are doing on your blog. My name (in short) is Tim and I am the administrator of the newly unveiled Christian Social Community: Rhemalog. Craving your indulgence, I will quickly like to intimate you on our purpose, goals and objectives. Rhemalog is a compound word, coined from “Rhema” and “Log”. Sharing with the beloved, the things that God has shown unto you in His Word. Rhemalog is established by the leading of the Holy Spirit, as a platform to enrich and impact the body of Christ all over the World! You will agree that there is a lot of degradation going on. Abuse, spiritual contaminations and pollutions. As one of the major (Christian) thinkers and opinion-makers out there, logically, it is a no-brainer that we need you, especially since our main goal is to ensure that the people are well fed. Together, we can build one of the most vibrant and impactful communities out there. Thanks and may God keep His face shining on you. What a fun event. Wish we had something like that in town. We went to a marching band event and she was in love with the drums. It was super fun! I love watching marching bands, too, although it’s been a while since we went to see one. Sounds like a great idea!